On Apple laptops, like the MacBook, MacBook Air, and MacBook Pro, Time Machine includes the added feature of creating local snapshots so that, if you disconnect your MacBook from its external hard drive, you’ll still have backups stored on your internal hard drive so you can recover data if you need to. While the iMore article points out how to disable/enable the feature (sudo tmutil disablelocal or …enablelocal in Terminal), here’s a bit more detail not provided in the article. First, this is not some hidden hack; you’re merely changing a setting using an Apple-provided command line interface to Time Machine. Apple, for whatever reason, chose not to include this setting in the GUI, but you’re not risking anything by making this change. Second, you’ll find the local backups in a root-only folder named .MobileBackups, at the top level of your hard drive. You can—sort of—see how much space they take up by selecting About this Mac from the Apple menu, then clicking on the Storage tab. On my MacBook Air, which has a 2GB local backup, I see 4GB of purgeable space, which I assume includes that backup. 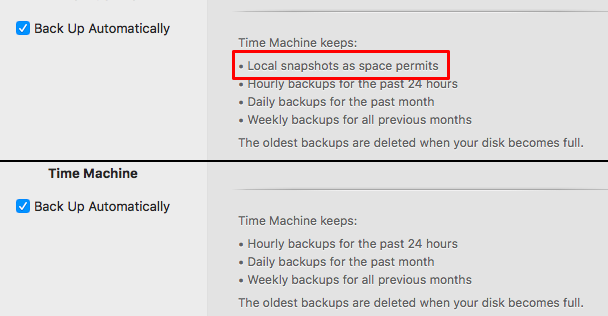 As seen, after disabling the setting, Time Machine’s System Preferences panel will no longer list local backups as one of the tasks it performs. I was surprised to see my backups are reported at 24GB. On a 256GB, that strikes me as high. Thoughts? From the detail in the iMore article, it does not seem high. macOS will delete them as it needs space, so in theory, you shouldn’t ever notice them there. A bright red tick mark is a backup that can be restored now, either from a local snapshot or your backup drive. When your backup drive isn’t available, only the local snapshots are bright red. A dimmed red tick mark is a backup that can be restored from your backup drive after that drive becomes available. Until then, the stack of windows on the screen shows a blank window for that backup. A gray tick mark is a backup that can be restored now from a local snapshot. A bright pink tick mark is a backup that can be restored now from your backup drive. A dimmed pink tick mark is a backup that can be restored from your backup drive after that drive becomes available. Until then, the stack of windows on the screen shows a blank window for that backup.